Duong Hoang, Pavol Klacansky, Harsh Bhatia, Peer-Timo Bremer, Peter Lindstrom, and Valerio Pascucci. IEEE Transactions on Visualization and Computer Graphics (TVCG) (Proc. of IEEE VIS), vol. 25, issue 1, pp 1193–1203, August 2018. doi:10.1109/TVCG.2018.2864853. Harsh Bhatia, Nikhil Jain, Abhinav Bhatele, Yarden Livnat, Jens Domke, Valerio Pascucci, and Peer-Timo Bremer. Computer Graphics Forum (Proceedings of EuroVis), vol. 33, issue 3, pp. 561–572, June 2018. doi:10.1111/cgf.13442. Harsh Bhatia, Attila G. Gyulassy, Vincenzo Lordi, John E. Pask, Valerio Pascucci, and Peer-Timo Bremer. Journal of Computational Chemistry, vol. 39, issue 16, pp 936–952, June 2018. doi:10.1002/jcc.25181. 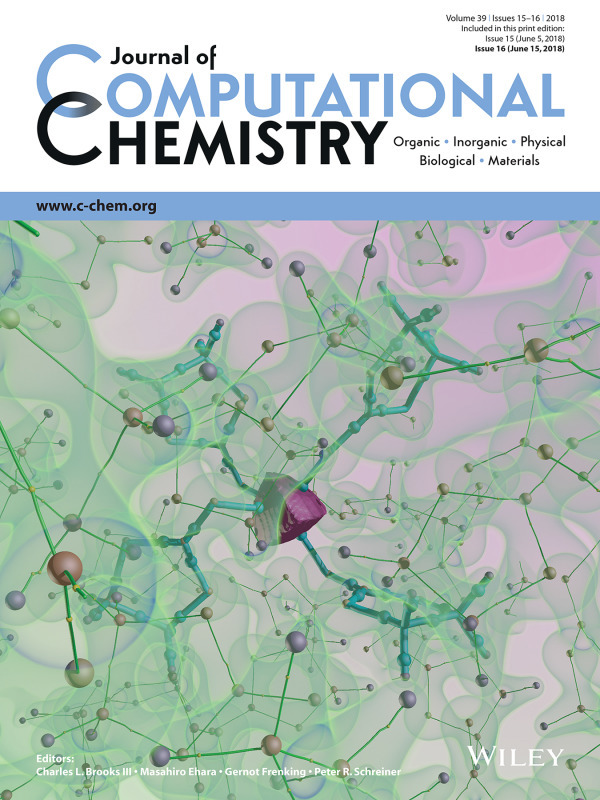 Appeared as the cover image of Journal of Computational Chemistry. Helgi I. Ingólfsson, Timothy S. Carpenter, Harsh Bhatia, Peer-Timo Bremer, Siewert J. Marrink, and Felice C. Lightstone. 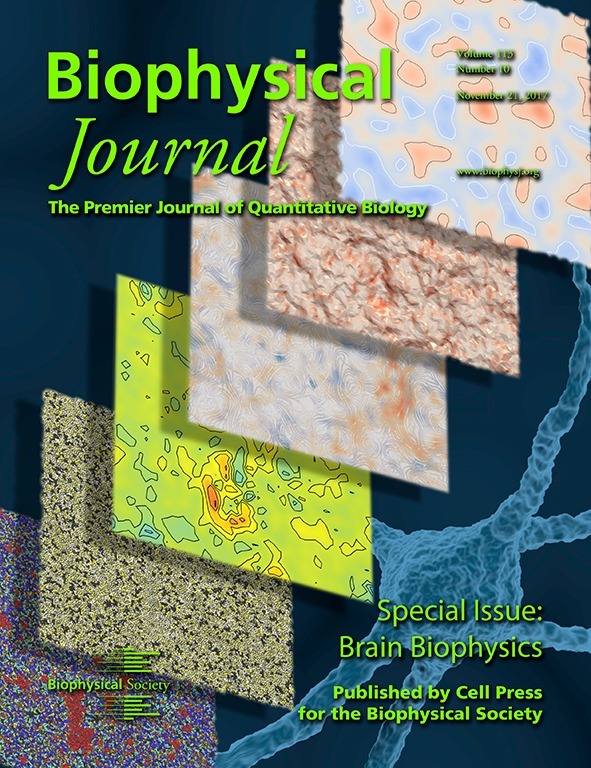 Biophysical Journal, vol. 113, issue 10, pp 2271–2280, November 2017. doi:10.1016/j.bpj.2017.10.017. Appeared as the cover image of Biophysics Journal, and appeared in the Best of 2017 collection. Mitchell T. Ong, Harsh Bhatia, Attila G. Gyulassy, Erik W. Draeger, Valerio Pascucci, Peer-Timo Bremer, Vincenzo Lordi, and John E. Pask. The Journal of Physical Chemistry C, vol. 121, no. 12, pp 6589–6595, March 2017. doi:10.1021/acs.jpcc.7b02006. ACM SIGCAS Computer Society, vol. 46, no. 3, Nov. 2016. doi:10.1145/3024949.3024952. Primoz Skraba, Paul Rosen, Bei Wang, Guoning Chen, Harsh Bhatia, and Valerio Pascucci. IEEE Transactions on Visualization and Computer Graphics (TVCG), vol. 22, no. 6, pp. 1683–1693, Jun. 2016. doi:10.1109/TVCG.2016.2534538. 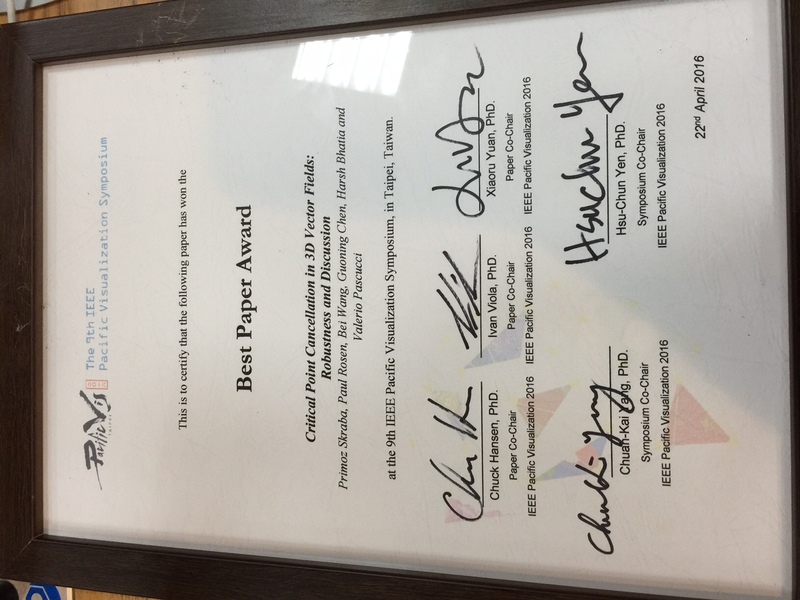 Won the Best Paper Award at IEEE Pacific Visualization Symposium, 2016. Harsh Bhatia, Bei Wang, Gregory Norgard, Valerio Pascucci, and Peer-Timo Bremer. Computational Geometry — Theory and Applications, vol. 48, issue 5, pp. 311–332, May 2015. doi:10.1016/j.comgeo.2014.10.009. The Natural Helmholtz-Hodge Decomposition for Open-Boundary Flow Analysis. Harsh Bhatia, Valerio Pascucci, and Peer-Timo Bremer. 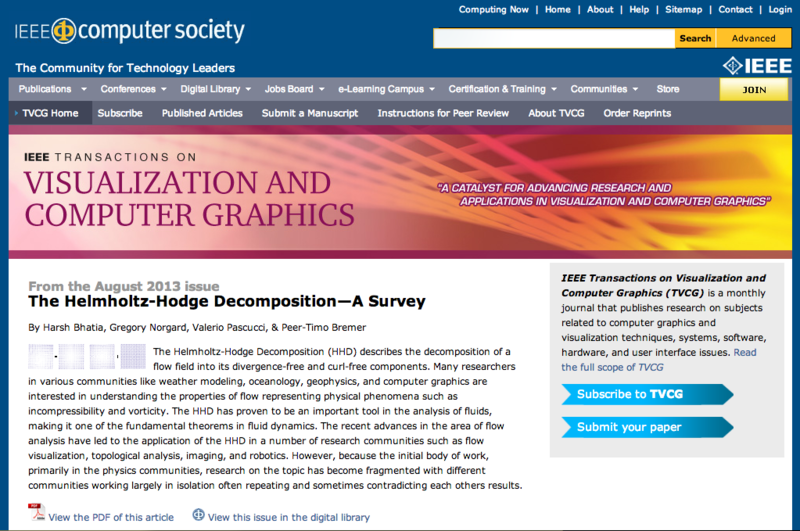 IEEE Transactions on Visualization and Computer Graphics (TVCG), vol. 20, no. 11, pp. 1566–1578, Nov. 2014. doi:10.1109/TVCG.2014.2312012. Extracting Features from Time-Dependent Vector Fields Using Internal Reference Frames. Harsh Bhatia, Valerio Pascucci, Robert M. Kirby, and Peer-Timo Bremer. Computer Graphics Forum (Proceedings of EuroVis), vol. 33, issue 3, pp. 21–39, Jun. 2014. doi:10.1111/cgf.12358. The Helmholtz-Hodge Decomposition — A Survey. Harsh Bhatia, Gregory Norgard, Valerio Pascucci, and Peer-Timo Bremer. IEEE Transactions on Visualization and Computer Graphics (TVCG), vol. 19, no. 8, pp. 1386–1404, Aug. 2013. doi:10.1109/TVCG.2012.316. Appeared as the IEEE TVCG spotlight of the month. Bei Wang, Paul Rosen, Primoz Skraba, Harsh Bhatia, and Valerio Pascucci. Computer Graphics Forum (Proceedings of EuroVis), vol. 32, issue 3pt 2, pp. 221–230, Jun. 2013. doi:10.1111/cgf.12109. Comments on the "Meshless Helmholtz-Hodge decomposition". IEEE Transactions on Visualization and Computer Graphics (TVCG), vol. 19, no. 3, pp. 527–528, Mar. 2013. doi:10.1109/TVCG.2012.62. Flow Visualization with Quantified Spatial and Temporal Errors using Edge Maps. Harsh Bhatia, Shreeraj Jadhav, Peer-Timo Bremer, Guoning Chen, Joshua A. Levine, Luis Gustavo Nonato, and Valerio Pascucci. IEEE Transactions on Visualization and Computer Graphics (TVCG), vol. 18, no. 9, pp. 1383–1396, Sept. 2012. doi:10.1109/TVCG.2011.265. A Quantized boundary representation of 2D Flow. Joshua A. Levine, Shreeraj Jadhav, Harsh Bhatia, Valerio Pascucci, and Peer-Timo Bremer. Computer Graphics Forum (Proceedings of EuroVis), vol. 31, issue 3pt1, pp. 945–954, Jun. 2012. doi:10.1111/j.1467-8659.2012.03087.x. 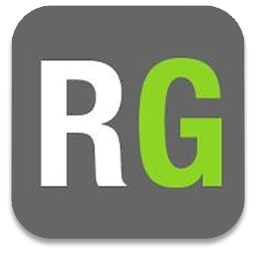 Interpreting Galilean Invariant Vector Field Analysis via Extended Robustness. Bei Wang, Roxana Bujack, Paul Rosen, Primoz Skraba, Harsh Bhatia, and Hans Hagen. In Topology-Based Methods in Visualization (TopoInVis), 2017. Interactive Exploration of Atomic Trajectories Through Relative-Angle Distribution and Associated Uncertainties. Harsh Bhatia, Attila G. Gyulassy, Valerio Pascucci, Martina Bremer, Mitchell T. Ong, Vincenzo Lordi, Erik W. Draeger, John E. Pask, and Peer-Timo Bremer. In Proceedings of the 9th IEEE Pacific Visualization Symposium, pp. 120–127, Taipei, Taiwan. Apr. 19–22, 2016. doi:10.1109/PACIFICVIS.2016.7465259. Computing Accurate Morse-Smale Complexes from Gradient Vector Fields. Attila Gyulassy, Harsh Bhatia, Peer-Timo Bremer, and Valerio Pascucci. In Topological and Statistical Methods for Complex Data — Tackling Large-Scale, High-Dimensional, and Multivariate Data Sets, Mathematics and Visualization, pp. 205–218, J Bennett, F Vivodtzev, V Pascucci (Eds. ), Springer Berlin Heidelberg, 2015. doi:10.1007/978-3-662-44900-4_12. Robust Detection of Singularities in Vector Fields. Harsh Bhatia, Attila Gyulassy, Hao Wang, Peer-Timo Bremer, and Valerio Pascucci. In Topological Methods in Data Analysis and Visualization III - Theory, Algorithms, and Applications, Mathematics and Visualization, pp. 3–18, P-T Bremer, I Hotz, V Pascucci, R Peikert (Eds. ), Springer Berlin Heidelberg, 2014. doi:10.1007/978-3-319-04099-8_1. Consistent Approximation of Local Flow Behavior for 2D Vector Fields. Shreeraj Jadhav, Harsh Bhatia, Peer-Timo Bremer, Joshua A. Levine, Luis Gustavo Nonato, and Valerio Pascucci. In Topological Methods in Data Analysis and Visualization II — Theory, Algorithms, and Applications, Mathematics and Visualization, pp. 141–159, R Peikert, H Hauser, H Carr, R Fuchs (Eds. ), Springer Berlin Heidelberg, 2012. doi:10.1007/978-3-642-23175-9_10. 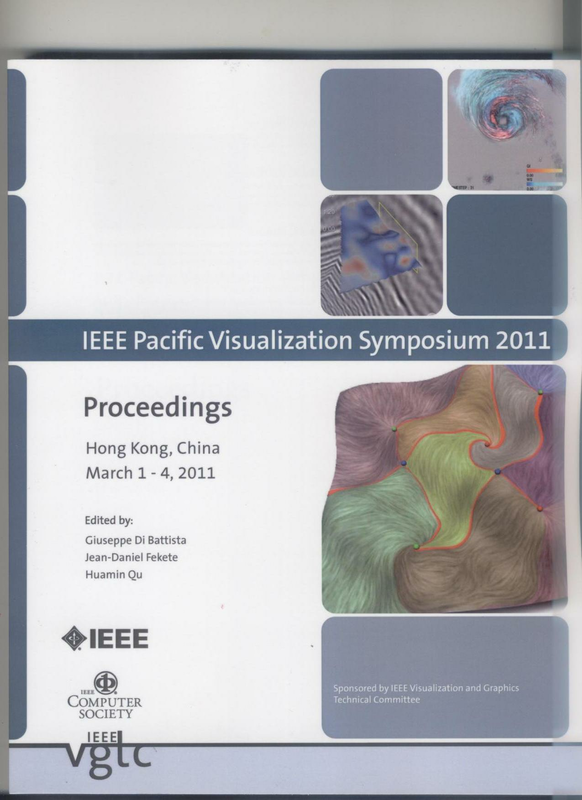 In Proceedings of the 4th IEEE Pacific Visualization Symposium, pp. 75–82, Hong Kong, China, Mar. 1–4, 2011. doi:10.1109/PACIFICVIS.2011.5742375. 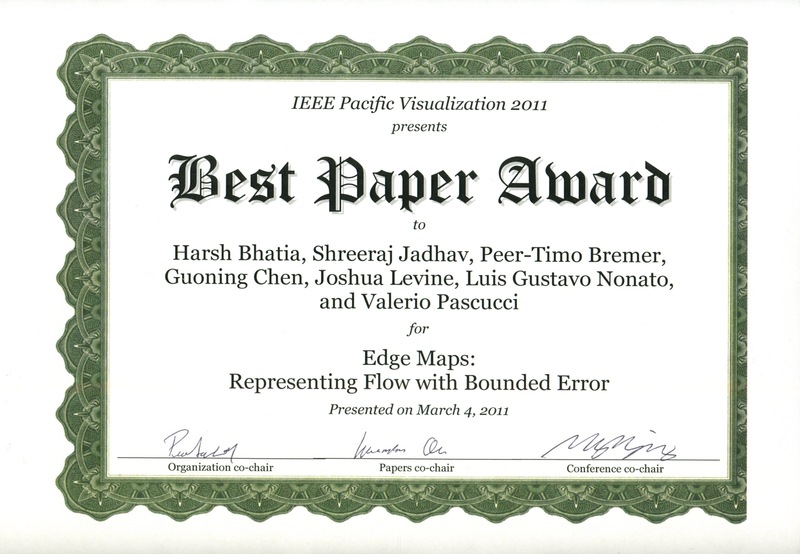 Appeared on the cover of the Proceedings, and won the Best Paper Award. A Queuing-Theoretic Framework for Modeling and Analysis of Mobility in WSNs. Harsh Bhatia, Rathinasamy B. Lenin, Aarti Munjal, Srini Ramaswamy, and Sanjay Srivastava. In Proceedings of the 8th Workshop on Performance Metrics for Intelligent Systems (PerMIS), 248–253, Gaithersburg, Maryland, USA, Aug. 19–21, 2008. doi:10.1145/1774674.1774713. Consistent Feature Extraction From Vector Fields: Combinatorial Representations and Analysis Under Local Reference Frames. Ph.D. Dissertation, The University of Utah, USA. May 2015. Application of QNA to analyze the 'Queueing Network Mobility Model' of Mobile Ad-hoc Networks. B.Tech. 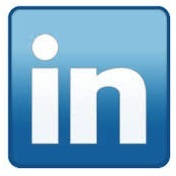 Project Report, Dhirubhai Ambani Institute of Information and Communication Technology, India. Jun 2007. A Parameter Based Approach to Counter SPIT. Harsh Bhatia, Naman Arora, and Shweta Sawhney. Student's Forum at the 15th International Conference on Advanced Computing and Communication (ADCOM), Guwahati, India, Dec. 18–21, 2007. Student technical paper at Osmosis — The Annual technical festival at MindTree Inc., Bangalore, India, Dec. 2005. MemSurfer: A Tool for Robust Computation and Characterization of Bilayer Membranes. Harsh Bhatia, Helgi I. Ingolfsson, Timothy S. Carpenter, Felice C. Lightstone, Peer-Timo Bremer. Biophysical Journal, vol. 116, issue 3, supplement 1, 91A, February 2019. doi:10.1016/j.bpj.2018.11.531. Topological Analysis for Molecular Dynamics. In Annual Post-Doc Poster Symposium, Lawrence Livermore National Laboratory, Jun. 2016. In Annual Post-Doc Poster Symposium, Lawrence Livermore National Laboratory, Jun. 2015. In 2nd Heidelberg Laureate Forum, Heidelberg, Germany, Sep. 2014. Enabling Streamline-based Analysis for Time-Varying Flows. 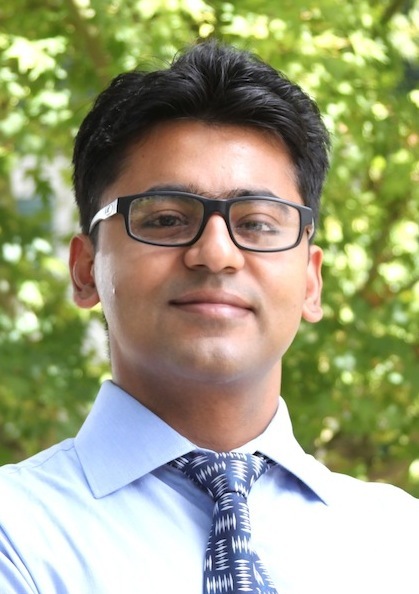 In Annual Post-Doc Poster Symposium, Lawrence Livermore National Laboratory, Jul. 2014. Flow analysis for Scientific Discovery. In SCIx: The annual research showcase of the SCI Institute, Dec. 2011.